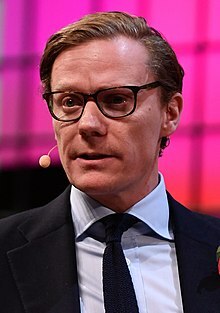 Alexander James Ashburner Nix (born 1 May 1975) is the former CEO of Cambridge Analytica and a former director of the Strategic Communication Laboratories (SCL) Group, a behavioural research and strategic communications consultancy, leading its elections division (SCL Elections). Cambridge Analytica helped Leave.EU with its Brexit campaign, according to both Leave.EU and Cambridge Analytica staff. The company was also engaged by the Ted Cruz and Donald Trump campaigns during the 2016 US presidential election. Both in the UK and the US campaigns, Cambridge Analytica used private information from over 87 million Facebook users harvested from their profiles without permission. On 20 March 2018, Nix was suspended from Cambridge Analytica after undercover video footage showed him claiming his company was using honey traps, bribery stings, and prostitutes, among other tactics, to influence more than 200 elections globally for his clients. Nix belongs to a noted banking and gentry family who owned a London private bank and a major estate in Crawley, and his family had strong ties to India during British colonial rule. He attended Eton before studying art history and working in finance. He is married to Norwegian shipping heiress Olympia Paus, one of the heirs to the shipping giant Wilh. Wilhelmsen and a member of a billionaire family. Alexander James Ashburner Nix was born on 1 May 1975. His father Paul David Ashburner Nix (1944–2007) was an investment manager who spent twenty-seven years with the M&G Group before joining Consulta in 1995, and was a shareholder of SCL Group. The Ashburner Nix family were wealthy bankers for several generations and had long-standing ties to India dating back to the East India Company's rule from the mid 18th century; family members were prominent merchants and administrators in British-ruled India. His family owned Tilgate House, a large manor and 2,185-acre estate in the Crawley area. It was purchased by the wealthy Indian-born businessman George Ashburner in 1862 and inherited by his daughter Sarah (born 1845 in Calcutta), who in 1865 married banker John Hennings Nix, one of the partners in the London private bank Fuller, Banbury, Nix & Co. His great-grandfather Charles George Ashburner Nix sold Tilgate House in 1939. Alexander Nix is also descended from liberal politician James Clifton Brown and from the banker and politician Sir William Brown. Alexander Nix grew up in Notting Hill, in West London, attended fee-paying Eton College, and studied art history at the University of Manchester. He later worked as a financial analyst with Baring Securities in Mexico for Robert Fraser & Partners LLP, a tax and corporate finance firm. In 2003, Nix left finance to join the SCL Group. Villa Paus in fashionable Bygdøy, Oslo was built for Olympia Paus' family in 1907 and is now the home of billionaire Petter Stordalen. Nix is married to Olympia Paus (Caroline Victoria Olympia Paus), a Norwegian shipping heiress of aristocratic origin who was born in Athens in 1976 and raised in London. Norwegian newspaper Dagbladet noted that Olympia Paus belongs to one of Norway's most prominent families, and both her parents independently have large fortunes. On her father's side she belongs to the aristocratic Paus family (pronounced [ˈpæʉs]), a family of steel industrialists and ship-owners that has been part of the Norwegian elite since medieval times, and her mother Cecilie Paus (née Wilhelmsen) belongs to the billionaire Wilhelmsen family and has been one of the main owners of Wilh. Wilhelmsen, one of the world's largest shipping companies, since 1978. Olympia Paus is a granddaughter of shipping magnate Tom Wilhelmsen. Her father's family had close ties to the royal family in Norway during the 20th century and her great-grandfather, Count Peder Anker Wedel-Jarlsberg, was Lord Chamberlain, the King's close confidant and the highest-ranking nobleman in Norway; his rank of "feudal count" would broadly correspond to Duke in the United Kingdom. Her 2nd great-grandfather, steel industrialist Ole Paus, was a first cousin of playwright Henrik Ibsen; Villa Paus in Oslo was built for him. She is also related to Count Christopher de Paus, a philanthropist and papal chamberlain, and her uncle is the businessman Peder Paus who is married to a former marchioness. Olympia Paus has never lived in Norway as her parents left the country in 1972 for Athens and London, where her father Christopher Paus worked in the shipping industry and as an investor; he has been reported to own shares worth close to 100 million British pounds in companies in the offshore petroleum industry. Olympia is the sister of designer and socialite Pontine Paus who also lives in London. In 2012 Nix and Olympia Paus purchased a home in Notting Hill for around 5 million pounds. They have three children. In 2013, Nix set up Cambridge Analytica as an offshoot of the SCL Group, to target voters in "more than 40 political campaigns in the US, Caribbean, South America, Europe, Africa and Asia". In the United States, it was involved in the 2014 midterm elections and the 2016 presidential primaries and election, during which it received funding from the Mercer family. Nix's firm supported both the Ted Cruz and Donald Trump campaigns for the US presidency by using "psychographic" profiles of voters built on data harvested from Facebook. Before the United Kingdom European Union membership referendum, 2016, Nix's firm was involved in supporting Leave.EU with its Brexit campaign, according to both Arron Banks of Leave.EU, former Cambridge Analytica employee Christopher Wylie, Cambridge Analytica's business development director Brittany Kaiser, and Leave.EU's communications director Andy Wigmore. In February 2018, Nix told the British parliament's Digital, Culture, Media and Sport Committee that his company had not received data from Facebook; following further media reports the committee's chairman, Damian Collins, said "We will be contacting Alexander Nix next week asking him to explain his comments." Nix denies deliberately misleading the parliamentary Select Committee. In March 2018, The Observer reported that Nix talked "unguardedly about the company's practices" when he was secretly filmed by Channel 4 News reporters posing as prospective clients and that Cambridge Analytica was trying to stop the broadcast of the resulting programme. Nix offered "beautiful Ukrainian girls" to discredit political opponents in Sri Lanka. The secret filming was screened on 19 March as part of a 30-minute segment, with a follow-up scheduled for the next day, focusing on its involvement in the Trump campaign. The conversation appears to portray Nix including entrapment and bribery as potential Cambridge Analytica services. On 20 March 2018, Nix was suspended from Cambridge Analytica. On 11 April 2018, The Wall Street Journal published an article about the CEO position at Cambridge Analytica, saying Nix "has officially resigned from his position, according to a person close to the company", but also that a "company spokesman ... denied that Mr. Nix had submitted his resignation". On 2 May 2018, Cambridge Analytica announced they were "closing and starting insolvency proceedings". On 8 October 2018, the Guardian reported that Nix referred to Mia Mottley, the elected Prime Minister of Barbados and other government figures via the racial slur of "Niggers" in email communications. On 23 January 2018, Nix was appointed director of Emerdata Ltd., a new company incorporated in August 2017, along with SCL chairman Julian Wheatland and Cambridge Analytica chief data officer Alexander Tayler. On 16 March 2018, Rebekah and Jennifer Mercer were also appointed directors, members of the Mercer family which backed Cambridge Analytica financially (by at least $15 million, according to the New York Times). Another director of Emerdata is Chinese businessman Johnson Chun Shun Ko, deputy chairman and executive director of Frontier Services Group, a private security firm which mostly operates in Africa and is chaired by US businessman and strong Trump supporter Erik Prince, who is best known for founding private military group Blackwater USA and being the brother of US education secretary Betsy DeVos. On 13 April 2018, Nix's role of director was terminated. ^ Butcher, Mike. "Cambridge Analytica CEO talks to TechCrunch about Trump, Hillary and the future". Techcrunch. Oath Tech Network. Retrieved 19 March 2018. ^ "SCL GROUP LIMITED Companies House data". Company Check. Retrieved 21 March 2018. ^ Hern, Alex (16 April 2018). "Far more than 87m Facebook users had data compromised, MPs told". the Guardian. Retrieved 23 November 2018. ^ "Cambridge Analytica CEO 'admits to dirty tricks'". The Week. 20 March 2018. Archived from the original on 20 March 2018. Retrieved 20 March 2018. ^ a b "Cambridge Analytica: Facebook row firm boss suspended". BBC News. 20 March 2018. Retrieved 20 March 2018. ^ Gilbert, David. "Cambridge Analytica Bragged About Using Fake News, Bribes, And Ukranian Hookers to Influence Elections". Vice News. Retrieved 25 March 2018. ^ Dwilson, Stephanie Dube (18 March 2018). "Alexander Nix: 5 Fast Facts You Need to Know". Heavy.com. Retrieved 20 March 2018. ^ a b Joseph J. Howard, "Ashburner," in Miscellanea Genealogica et Heraldica. Vol. 1. pp. 224ff. 1874. ^ "Executive Profile: Alexander Nix BA: Director, SCL Group Limited". Bloomberg L.P. Retrieved 19 March 2018. ^ a b "Alexander Nix Profile". Campaign. Retrieved 19 March 2018. ^ "Alexander Nix' norske kone er rederarving og står midt i Facebook-skandalen" [Alexander Nix's Norwegian wife is a shipowner and stands in the midst of the Facebook scandal]. Dagbladet (in Norwegian). ^ a b Rosenberg, Matthew (17 March 2018). "How Trump Consultants Exploited the Facebook Data of Millions". The New York Times. Retrieved 21 March 2018. ^ Auchard, Eric (19 March 2018). "May very concerned by Facebook data abuse reports". Reuters. Retrieved 20 March 2018. ^ Business Insider 21 March 2018: "All the times Cambridge Analytica gave brazenly contradictory accounts of its murky work on Brexit"; retrieved 22 March 2018. ^ a b The Observer, 26 February 2018: Robert Mercer: the big data billionaire waging war on mainstream media; retrieved 22 March 2018. ^ a b Cadwallader, Carole (17 March 2018). "The Cambridge Analytica Files : 'I made Steve Bannon's psychological warfare tool': meet the data war whistleblower". The Observer. Retrieved 19 March 2018. ^ a b Cadwalladr, Carole; Graham-Harrison, Emma (19 March 2018). "Facebook and Cambridge Analytica face mounting pressure over data scandal". The Observer. Retrieved 19 March 2018. ^ Rajan, Amol (19 March 2018). "Data and the threat to democracy". BBC News. Retrieved 19 March 2018. ^ "Cambridge Analytica sends 'girls' to entrap politicians". The Times. 20 March 2018. ^ Rosenberg, Matthew (19 March 2018). "Cambridge Analytica, Trump-Tied Political Firm, Offered to Entrap Politicians". The New York Times. ISSN 0362-4331. Retrieved 20 March 2018. ^ Garside, Juliette; Osborne, Hilary (8 October 2018). "Former Cambridge Analytica chief used N-word to describe Barbados PM". the Guardian. Retrieved 8 October 2018. ^ a b c "EMERDATA LIMITED Filing History". Companies House. Retrieved 21 March 2018.